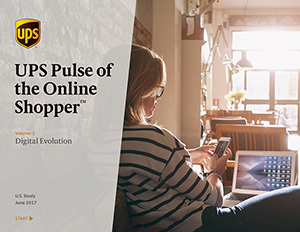 This is the first of five volumes of the sixth annual UPS Pulse of the Online Shopper™ Study. Developed in partnership with comScore and the e-tailing group, this study is designed to provide insights into online shoppers’ behaviors and preferences. An excellent customer experience is paramount across all channels and a must for today’s retailers. Discover what shoppers think about digital channels in the convergence of online and in-store as the quality of the customer experience takes priority. Optimizing your digital channels to enable consumer searches is key considering the growth of online shopping. Find out the dynamics and preferences of online shoppers’ browse and buy behavior. Accelerated interest by shoppers for online research and purchase are driving future retail growth. Get up to speed on preferred devices and channels in the digital evolution. Enter the following information to get the complimentary study. You're all set to download.